Most people are curious about IV vitamin therapy but haven’t yet tried this procedure because it sounds a little odd, or they’re afraid of needles! IV vitamin therapy has hit the mainstream market — meaning celebrities are using it — and it’s beginning to pop up around clinics all over the US. Not only are Rihanna and Cindy Crawford partaking in this healthful drip, but athletes, musicians and actors have been calling on it for any edge they can get on their competition. So what’s sorts of extraordinary health benefits does IV vitamin therapy tout? Find out all about this method below. To reap the benefits of the vitamins that your body craves, you would think eating an orange or some lacinato kale would do the trick, but sadly, conventional farming has depleted the soil and vitamin content in produce has seen a sharp decline. Comparatively, it’s not as if you should ditch the recommended five servings of vegetables and fruits per day, but a conventional carrot today distinctly contrasts a carrot from the 1970s. As farming practices continue to over farm land, each generation produces crops less nutrient-dense than the last, continuing a food cycle that leaves people vulnerable to vitamin deficiencies. To further cement the issue, the Journal Of The American College Of Nutrition carried out a study that found “reliable declines” in 43 fruits and vegetables nutrients such as protein, phosphorus, iron, B2, calcium, and vitamin C over the past 50 years. Not only is our soil leaving a nutrient deficit, consuming highly processed foods will also impact the manner in which your body absorbs vitamins and minerals. While processed foods may afford us the luxury of shelf-stability and keeping food in our pantries for years, they also affect the nutritional quality and lead to obesity because of their added sugars, hydrogenated fats, and high sodium content. In the production of processed foods, extrusion, thermal processing, and milling can physically remove vitamins and minerals. In addition, factors such as temperature, time, storage composition, and storage all greatly affect the vitamin and mineral content we are able to absorb. Processed foods can not only rob nutrients in their processing, but they can actually hijack your bodies ability to absorb certain nutrients. Processed sugar – Processed sugar comes in many varieties including cane sugar, fructose, dextrose and evaporated cane juice to name a few and it can deplete your body of vitamin C, calcium, and magnesium. Magnesium is actually one of the most widely seen deficiencies in Americans. High fructose corn syrup (HFCS) – This substance is also known as corn syrup and corn sweetener, and it robs your body of magnesium, zinc, and chromium. Soy – Heavily processed soy — not the sprouted kind — such as soy milk, soy lethicin, and textured vegetable protein, can leach the body of iron and enzymes. Phosphoric acid – This compound is found widely soda and flavored waters and is the additive used to create the bubbles in carbonated drinks from going flat. It can block your absorption of calcium and magnesium. 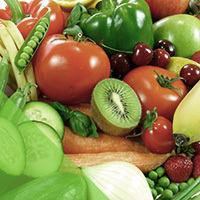 The takeaway from consuming foods that either lack nutrients or rob your body from absorbing them is that, over time, your body will develop a nutrient deficiency which leads to a host of health issues such as muscle cramps, low bone density, fatigue, muscle aches, pale skin, thinning hair, brain fog, and impaired immune system. Contrary to popular thought, vitamin and nutrient deficiencies are not a thing of the past and with obesity rates continually and rapidly increasing, deficiencies are much more a part of modern day American history. So how can we address this health issue? Eliminating highly processed foods is a great place to start, along with eating organic and non-gmo vegetables and fruits. 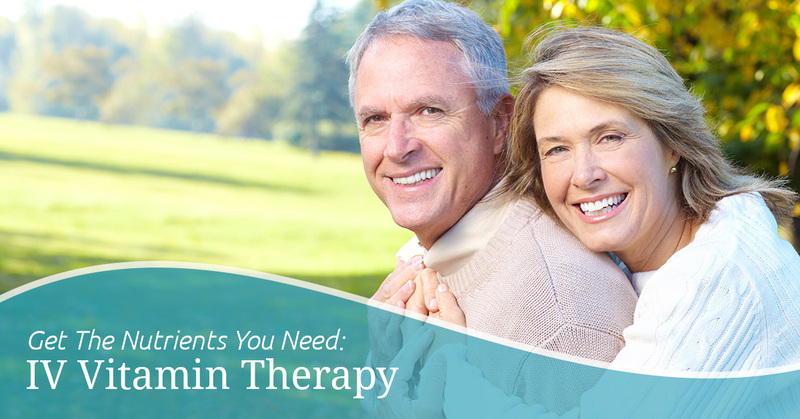 If you’re suffering from symptoms of a vitamin deficiency such as fatigue, bloating, and skin problems, IV vitamin therapy is a perfect solution to support your body. You may also want to implement IV vitamin therapy if you’re a training athlete, or if you’re someone who just wants to reap the instantaneous health benefits that IV vitamin therapy provides. People will also book an appointment for a wicked hangover cure, and while we’re not advocating that, it’s a trend in IV vitamin therapy. IV vitamin therapy is performed by a doctor in our clinic with knowledge of how to properly balance fluids with vitamins and minerals. It’s important to state that you should always get IV vitamin therapy in a reputable clinic or facility such as Rejuvenate Image Restoration. You are hooked up to an IV, so a needle is used to allow for the vitamins to enter your bloodstream. The procedure begins with an administration of nutrients that quickly and immediately absorb into your bloodstream. What is wonderful about IV vitamin therapy compared to tablet or capsule forms of vitamins, is there is 100 percent bioavailability — your body absorbs it all! Vitamins and nutrients flood the bloodstream and are able to address deficiencies at a cellular level for noticable, quick effects. Does IV vitamin therapy produce results? Every person will respond differently to IV vitamin therapy and because of its 100 percent bioavailability, some people will feel great after one session, while for others it will take a string of IV vitamin therapy drips. You can use them as needed, but if you have a health issue, it’s wise to consult with our doctors to establish an IV drip schedule tailored to your requirements. Here at Rejuvenate Image Restoration, our primary focus is to help you feel and look your best. 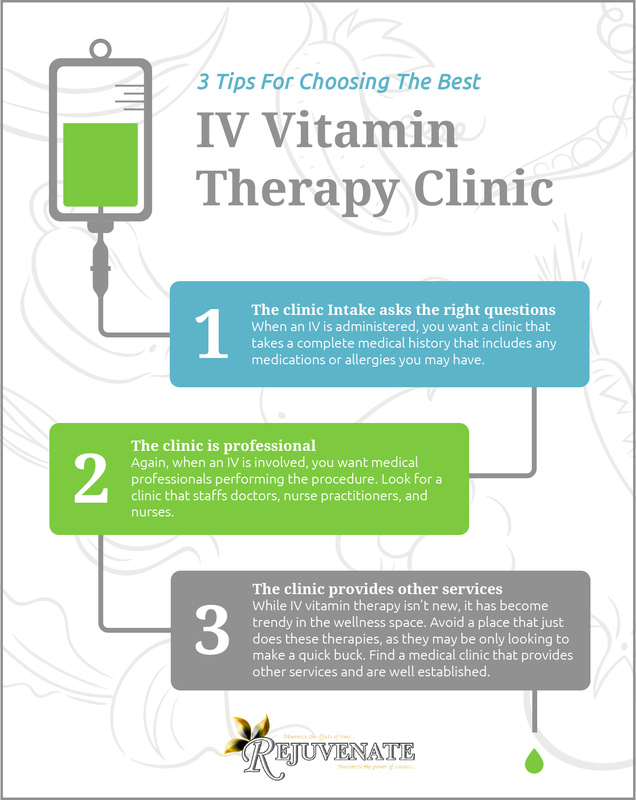 We’ve established a clinic where you can come in for a IV vitamin therapy session to help combat vitamin deficiencies and simply to be your best self. At Rejuvenate, we offer a myriad of IV therapies to tailor to your body’s specific needs in a clinic with trained doctors to administer and prescribe the optimal drip. Take power of your health and schedule an IV vitamin therapy drip today!